Jane Huets, With Walt Whitman: Himself, Circling Rivers, ISBN 978-1-939530-06-6, 192 pages. Scott T. Starbuck, Carbonfish Blues: Ecopoems, (with art by Guy Denning), Fomite, ISBN 978-1-944388-53-9, 93 pages. Jacob M. Appel, Amazing Things Are Happening Here, Black Lawrence Press, ISBN 978-1-625577-05-4, 152 pages. These past six months I have received some interesting books from publishers concerned with three different subjects — a Walt Whitman documentary biography, a book on ecological poems with paintings of war and climate refugees, and a collection of short stories, which are strangely and memorably linked to each other due to their images and themes. These books are extraordinary due to their new treatment of old subject matter, their manner of presentation, or their ability to capture and hold one’s interest. Two of the three use visual media such as paintings, photographs and reproductions of historical documents to reinforce their points. The third’s fiction writing style is so explicit, its characters and images that will remain with you long after you have put the book down. The first book is Jane Huets’ With Walt Whitman: Himself from Circling Rivers. This book is a beautiful, multi-media documentary of Whitman’s life and times and includes gems this reviewer was previously unaware even though he thought he knew Whitman’s biography fairly well. Its multi-coloured texts and reproduced images also make it suitable for instruction in secondary and tertiary schools. These gems include a reproduction of a draft of ‘Live Oak with Moss’ and pages from his journals. One early 1860s journal entry includes a sketch of a soldiers’ hospital ward, the location of the men’s beds and also list of some of the men’s requests for reading material or for contact with clergy. Having read over a dozen books about Whitman and his written works, this is the first book I’ve seen which adequately describes Whitman’s immediate family and his ancestors, their influence on his life, and his parents’ and siblings’ response to his writing. (For example, Whitman moved away from New York at least twice in his life to be with family in St. Louis, Missouri and in Camden, New Jersey). The book also provides an interesting selection of paintings, drawings and photographs of the places Whitman worked, lived and frequented and also of Whitman and his friends and associates. This includes paintings of then rural Long Island, where Whitman’s father tried twice unsuccessfully to farm. Walt Whitman: Himself also explores Whitman’s participation in literary circles and their New York hangouts and patrons such ‘Pfaff’s Chop House and Beer Cellar’ and ‘Henry Clapp’, who ran ‘the weekly literary magazine Saturday Press’. The book also mentions Whitman’s early artistic supporters such as Anne Charlotte Lynch Botta and Anne Gilchrist. It also mentions Whitman’s attendance at musical and theatrical performances in New York influenced his work, with specific references to his poetry. Colour plates, paintings, drawings and photographs are beautifully reproduced and take up a significant portion of the book’s pages making it suitable for use in secondary and community college settings, although I suspect many scholars will also appreciate many of the documents, paintings or photographs Huets has assembled in With Walt Whitman: Himself. The second book is Carbonfish Blues: Ecopoems by Scott T. Starbuck with artwork by Guy Denning. His book includes poetic observations of sequoias and spruces which live hundreds of years longer than humans, displaced Pacific Islanders who remember the ease of their ancestors, how rising sea levels will effect the world map and species, and the deaths of boat refugees. As he cleans a bluefin he’s caught in ‘Breadfruit’ he meditates on the four things that human beings really need to do to survive: ‘eat, mate, avoid predators, / three ways to give Thanks / to the Source of all.’ Thanks. Opposite ‘Breadfruit’ is one of Denning’s 12 artworks. This one of a face in blue grey colours with an open, downturned mouth entitled Requiem 2 (for the now forgotten) and another face, Opposite Starbuck’s poem ‘One Raven’, about the Sitka Spruce’s more expansive sense of time, is a copper, brown face with eyes open looking out towards the reader on in a background of what appears to be books and newspapers. Denning’s art underscores the importance of Starbuck’s warnings about the destruction ahead due to global warming. In ‘Climate Reality’ Starbuck places the blame for global warming on schools and employers who: ‘said / if you followed the rules / you would be okay. …. The truth is …. they lied.’ ‘Rosetta Poem’ emphasizes mankind’s and Nature’s common ancestor. Starbuck reflects: ‘is it possible distorted language / has been (the) real enemy / all along?’In the next two poems, ‘Titanic Radio and the book’s title poem, ‘Carbonfish Blues’, Starbuck compares the sinking of the Titanic and the drowning of its passengers, especially those in ‘2nd and 3rd class’, to what will happen to those people (the poor) for whom no ‘lifeboats’ were even planned and others like Esther Hart, who stayed up all night fully dressed, ‘ready in a way / none can be for abrupt climate change’. Starbuck’s poems also discuss the floating plastic waste in the world’s waters ‘Floating Plastic Jesus’, the endangerment and extinction of species in the last century ‘Warrior’s Story of The Last Wild Otter’ and ‘Invader’, and the price, according to Dr. Veerabhadran Ramanathan ‘per person per year in the top one billion people’ to save billions of people from death by heat, is ‘$450’. His dire poetic descriptions of habitat destruction due to over-harvesting, fishing and hunting, pollution and global warming are placed beside Denning’s artworks that depict warzone/ climate refugees or the faces of the dispossessed, such as in Denning’s sketch on a grey background of an expressionless face entitled Your opinion is worthless. Is our opinion and action worthless when it comes to global warming? Starbuck’s poem ‘Stepford Congress’ is ‘bought / by oil companies, / and dying / with them.’ doesn’t seem to show much optimism. In ‘Observer Post 9’ he imagines Earth’s epitaph written by an alien civilization. Students there ask their professor if the reasons humans drove every week to ‘‘poison stations’ / with many other options’ were “Convenience?” and “Insanity?” Their professor unfortunately answers: ‘“Yes and yes”’. The last book is Jacob M. Appel’s Amazing Things Are Happening Here, his ninth book of short stories and his fifth with Black Lawrence Press. This collection of stories, with their snap endings, are set on the East Coast in Appel’s favourite fictional town of Creve Coeur, Rhode Island, in Manhattan or in Florida. One of his returning character types is the shy, male protagonists in ‘Canvassing’ and ‘Embers’, who despite their goodness and devotion, do not get the gal, and, in the first story, is also not as nice and as patient as he seems. One thing that I find also enjoyable in short story collections are stories which are connected with each other thematically over time. Passion rules the day. The heart knows what the heart wants — and in the case of three female protagonists in ‘Canvassing’, ‘Grappling’, and ‘Live Shells’ — the heart wants bad boys. It isn’t interested in the logical suitors with steady jobs, from the right side of the tracks. It wants passionate and/or burly men from the wrong part of town. Three stories with plot lines that for me are departures from Appel’s previous subject matter include ‘Helen of Sparta’, ‘Amazing Things Are Happening Here’, and ‘Dyad’. The first story involves the black sheep of a family returning drunk to her old high school to visit her old drama teacher, (long deceased), who almost gets herself and her nephews arrested for entering without permission. In ‘Amazing Things are Happening Here’, the collection’s title story, the head nurse at a Manhattan psychiatric hospital covers the disappearance of a patient for weeks by falsifying his file with fictional meds, treatments, consultations and ultimately a discharge. The story’s tension is due to the fact that someone, probably the narrator, will lose his/her job if the patient isn’t found, so that the falsification of the discharge is preferable to revealing the truth. And in ‘Dyad’, a childless, female ocean park ranger, contemplates leaving her husband for a French oceanographer and his eighth-year-old daughter, as they both urge the ranger to use her boat to keep some whales from stranding. She changes her mind, however, when one of the whales they had ‘saved’, suddenly and unexpectedly beaches itself anyway. My criticism of this collection includes the following observations. ‘Bigamist’s Accomplice’ has a storyline I’ve read before in at least one other writer’s fiction work. A man and woman, who have Alzheimer’s, find each other in a senior home and their real partners decide to let them have each other (a rabbi even performs a fake wedding) because their partners with memory loss no longer recognize them and they realize these partners will be happier together. My second criticism would be that some of the narrator’s vocabulary in ‘Live Shells’ occasionally seems not to be her own such as when she mentions ‘ersatz windmills’ and ‘inertia.’ Perhaps, however, I’m being unfair to working class, shop-operating, triple divorcees. Lastly, in ‘Grappling’, Jeb Moran, this story’s 1920s bad boy, who has spent time in the state penitentiary, uses the ‘N’ word once when reporting from whom he had won money through gambling and cockfights. These reservations aside, however, Appel’s collection of short stories, brings to life the lives of American bad boys — gator wrestlers, machinists, murderers, bigots, and even a homicidal teenage wallflower — and the women who have been attracted to them or who have failed to notice their dangerous presence. Appel’s stories in Amazing Things Are Happening Here create a world where unfortunately, fabricating the truth, is often preferable and less complicated than telling the truth or facing it. 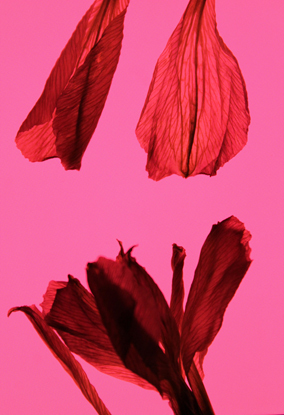 Diaphanous, Jury S. Judge, photograph, 2018. Ladislav R. Hanka is an artist dwelling among the Great Lakes of North America. His artwork examines themes of life, death and regeneration – nature as the crucible in which man finds a reflection of his own life and meaning. Most recently this work has involved close collaboration with honeybees and placing his drawings and etchings into living beehives. This contribution to Amsterdam Quarterly is largely excerpted from a book currently being prepared for publication and entitled The Honeybee Scriptures. 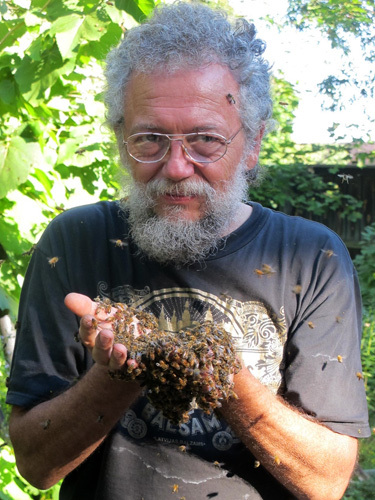 I am an artist and keeper of bees — two venerable vocations whose roots extend to the Neolithic and into a time when the roles of artist and shaman were essentially interchangeable. The several etchings you see here, encrusted with amber-hued beeswax, are made in the time-honoured way, much as Rembrandt recorded the Dutch landscape on copper plates in the 17th century. They are made by hand and rely upon extensive fieldwork before being completed in studio. 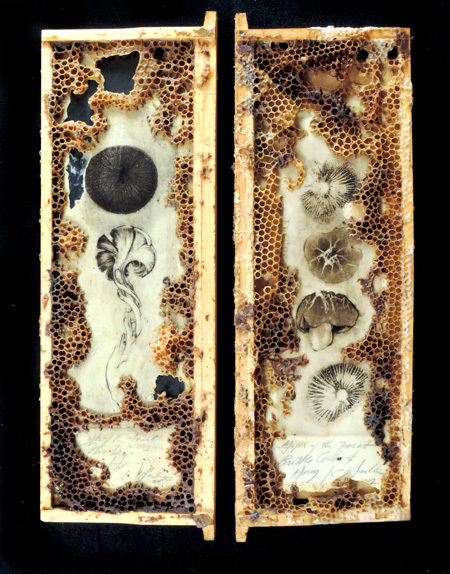 These works often take on a second life, when I insert them into a living beehive, where bees take over and continue the now collaborative creative process. Bees will eventually cover everything in wax or even capped honey — or conversely, they may take a dislike to the intrusion, in which case swarms of little critics will start chewing up my precious artwork. I must therefore continually monitor the hive in order to reclaim my work when I deem it to be completed. Entering the hive to check on developments is not as dramatic as you may think. Generally I can dip my hands into the living, swirling bug soup unmolested and inspect my art as well as the larval bees and honey stores, while the bees go calmly about their business. There are, however, days when bees soon become agitated and then the interspecies communication is direct. If you are wilful enough to ignore guard bees bouncing off your forehead, you deserve to be stung – and yes, I do get stung. Still, the collaboration has been well worth any discomfort I may suffer. These wondrous, little beasties have rewarded my efforts richly, adding their accretions of wax in the exquisite ways with which Mother Nature has equipped them. I find their additions to be as inevitably elegant as the endless variety of gently curving veils of honeycomb you’ll find hanging from the domed ceilings within a bee tree. But why am I so taken with all this to stay with it for years? That is harder to say and requires reaching more for evocation and metaphor than relying upon direct answers. Perhaps a story is the best way to enter that unstable ground. 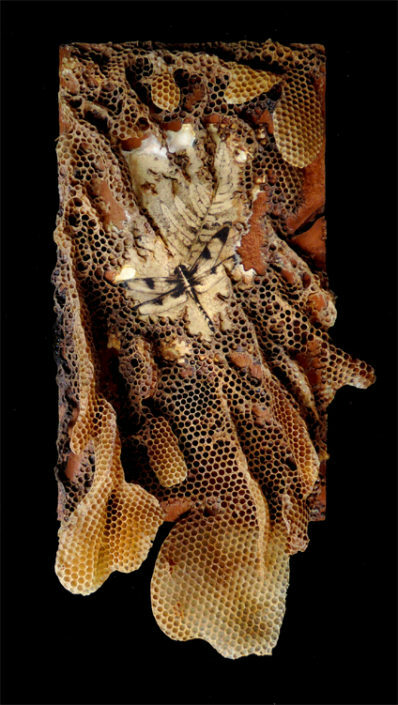 Ladislav R. Hanka, Dragonfly Draped in Honeycomb, etching with drypoint and beeswax added by honeybees in a living hive, © 2018. The scene is of an old woman, home alone and watching TV, when they announce a contest for the most beautiful tree in all the land. This gets her attention, for she has a grand old pear tree in the garden — her companion from childhood. Like herself, the tree is growing old and withering away, but clearly a contender. History and character are there in spades, etched into every knobby crook and knotted, gnarly joint. She takes a picture, sends it in and wins the contest. Happy as a clam, she hangs the prize up on the tree for all to see. A year goes by and they run the popular contest again, so she catches a ride into town for the award ceremonies. The popular Czech comedian, Jaroslav Dušek, hosted that show and as he tells it, the previous year’s winner came up on stage and cryptically handed him a wine bottle. ‘Well now, dear Auntie,’ he asked her in his best stage voice, ‘what have we here?’ And she told him. without equivalent stagecraft, that her pear tree won the prize last year, and then soon after, began to noticeably green up, sprouting new leaves and even branches. But, that’s not all. When spring arrived, her tree blossomed as never before and hosted absolutely remarkable numbers of bees. The ensuing fruit too, was bountiful and then received a full summer’s sun. Well, that dear old pear tree hadn’t born any fruit in years. As she watched those pears ripen to a full rich flavour, she knew she was witnessing a miracle. And that bottle she handed off on stage? Well, that sweet little old lady had picked, mashed and fermented the pears herself and then carefully distilled the wine in the time-honoured way of her ancestors. She’d produced a powerful clear brandy — the very essence of all that is delectable about a pear at its late summer peak — and proof positive, that the dear old tree appreciated being noticed. Ladislav R. Hanka, Dragonfly Embellished with Veils of Living Amber, etching with drypoint and beeswax added by honeybees in a living hive, © 2018. Well, my friends, I have drawn enough old trees, meditated in their shade and listened to them tell me their stories, that I know the truth about trees when I hear it. All the many creatures, with whom we share God’s green earth, wither away with neglect, or conversely, come to life and blossom when bathed in loving attention — me, thee, trees and bees included. This is why I draw trees, mushrooms, minnows and spiders, and why I also talk to my bees. I urinate in the bee-yard to be sure they know my smell and they reward my attentions by working on my etchings with a sensitivity that speaks of knowing my intentions. Bees do seem to know a lot and they clearly have a relationship with their keeper. Folklore is rich with anecdote about this. As recently as 2007, a Scottish newspaper commented upon an elderly beekeeper’s funeral near Edinburgh — that his bees swarmed and followed the hearse right into the churchyard. Attending their master’s funeral is a phenomenon that is often mentioned in the folklore of beekeeping. In my own maternal Czech tongue, there’s a separate word for death, when used for animals as opposed to people — except when bees die. Then we use the human expression for passing. There is something special about bees and it goes way back — back before the word itself was even written. It may not sound like good science, but it is good myth, as well as truth writ large — the kind of truth with roots that run deep enough to sustain us in hard times. This is, of course, the very point of art — at least any art that hopes to feed our souls tomorrow, and next year as well. Such art must contain a generous spectrum of experience — from the mythic to the spiritual, the technical and serious, to the downright laughable. And so I indulge in creating scripture, drawings and etchings — which are then annotated, redacted, and embellished by honeybees. I have also seen fit to tell my stories, not so much as definitive statements of truth, handed down from on-high, but in ways which I hope will open the doors of perception a crack and allow others entry, to observe the artist at play — as a fly on the studio wall. Storytelling has a way of going off on tangents that are indeed telling — that inadvertently allow something more to slip out. One’s nagging doubts and questionable motivations come out, alongside admissions of living with contradiction in an imperfect world — one in which we rarely live up to our own beliefs and standards. With some luck, even the big questions, so boldly sincere, we know not how they escaped our notice, will see the light of day — the ones that force us to look at the unexamined. Opening a hive is good for clarifying the order of things — for getting out of one’s head and abstraction and back to the present — fully conscious. One’s attention assumes a crystalline clarity, when focused upon the sound of tens of thousands of buzzing insects, each with a venom-laden stinger just inches away. They get increasingly agitated as I reach in and pull out their winter stores. I read the ledger of their lives in frame after frame of brood and honey in order to manage the hive, but it’s not without its limits. There comes a point when they’ve had enough of my intrusions. They tend to let one know, but we do need to be attentive. Since I generally wear little more than light summer clothing, I really do need to be sensitive to their communication, or suffer the consequences. Anna Ill Marovich, Lad with his girls, photograph, © 2017. Bees are my subject here as well as my collaborators and medium. Honeybees are, of course, in trouble and anybody who has not been living under a rock should be getting nervous about that and the source of their own food in the very near term. 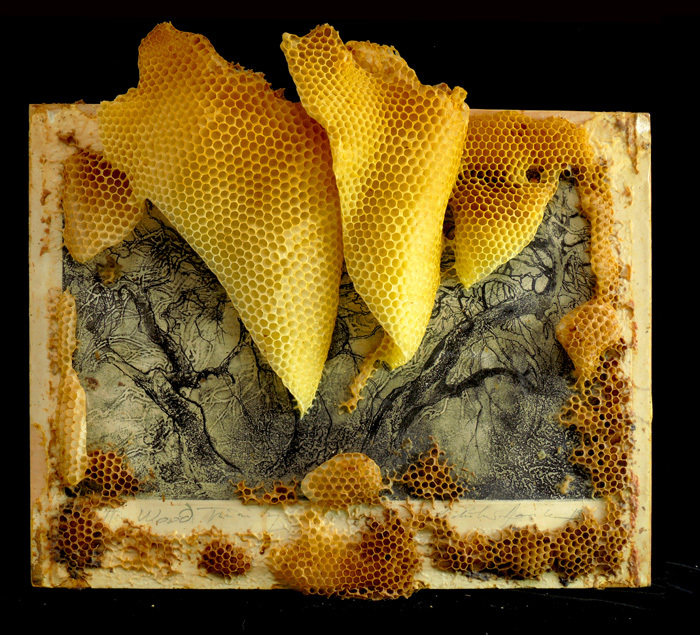 The artwork being immersed in hives is a culmination of thirty years of work as a printmaker and informed by my decades as a naturalist, zoologist, and environmentalist — even as a monitor of nuclear power plants and as a chemist synthesizing pesticides. I have at times worked for the evil empire, taken its money and eaten the food from its fields. Of course, when you get close to it, this evil empire becomes much more nuanced and composed of many disturbingly normal and limited people with complexes of mixed motives as well as needs and fiduciary responsibilities that lead to questionable choices made under the usual clouds of obscuring conflicted interests. How dreadfully ordinary. Honeybees, however, are far from ordinary. They have not only entered my artwork, but gotten under my skin and into my blood. There is nothing quite like settling down in the grass after a day of tending bees, next to a hive and popping a beer. Going off into mid-summer reverie, I enter dreamtime as the workaday world recedes into mere background noise. The hum and the smell of a hive permeating my immediate environment is positively intoxicating, as bees alight on my skin, sniff around and fly off again — just doing what bees do. Such are the timeless, primordial pleasures that life can offer, when a stolen moment, shared with bees, telescopes into a glimpse of eternity. There is an undeniable intelligence at work in a beehive. Working with bees you learn to respect that and indeed care about these endearing creatures and the folklore that has arisen around their tending and care. Esoteric traditions speak of an Akashic Record in which all things from all times are recorded and accessible to those who’ve earned the right of entry. 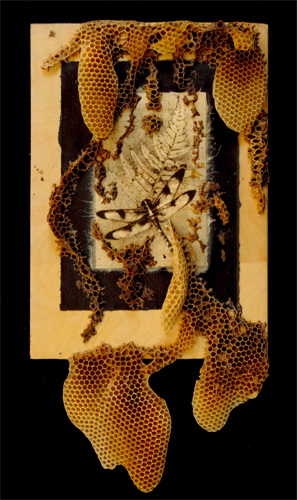 Among the many works of art being harvested from my beehives, there are several fanciful entries into that very book of records, opened to pages featuring decomposers and pollinators. Elsewhere bugs and bushes will be seen intruding at the edges of untended fields, while under the surface, the roots of agricultural row crops are being infiltrated by beetles, snakes and Sassafras rhizomes. A book of books … perhaps a Scriptum Apium melliferum, or indeed the Honeybee Scriptures. Ladislav R. Hanka, Fields Going Wild and Embalmed by Honeybees, etching with drypoint and beeswax added by honeybees in a living hive, © 2018. Collection of Midwest Museum of American Art, Elkhart, Indiana, USA. In the great cycle of being, creation and decomposition are but two sides of one coin recorded in this Librum aeternum on verso and recto sides of the same sheet. Bees pollinate and plants reconfigure the molecules of air, soil and water, which soil fungi then again pry loose from the dead and release back into the system. Of course, bees are in trouble and bee trees are increasingly rare. Crops are now threatened by a paucity of pollinators. Even the once resilient decomposing side of the cycle is weakened by pernicious pollutants, which, having no obvious chinks in their armour, are not easily broken down. All the earth is an interdependent system of connected vessels — much like the lava in one volcano, which recedes into the depths of the earth in response to the lava in another volcano hundreds of miles away swelling up into the cone and flowing up over the lip and down its fiery slopes. 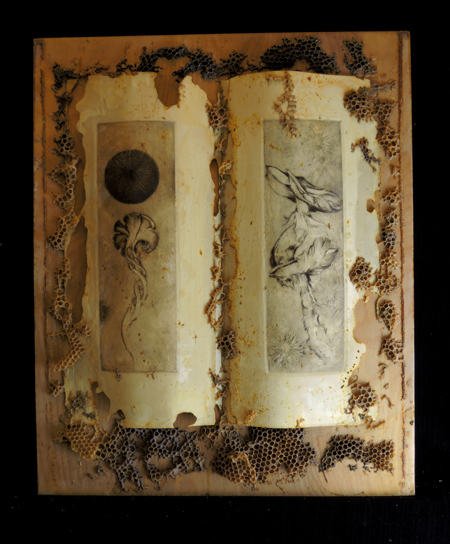 Ladislav R Hanka, The Book of Decomposers Ornamented by Honeybees, etching with drypoint and beeswax added by honeybees in a living hive, © 2017. I’d like to do something about all of that, but I am neither scientist nor politician. I am an artist and a beekeeper — member of two ancient, esoteric brotherhoods whose roots reach back into the mists of time and down to the very bedrock of civilization — among the first professions. Seventeen thousand years ago, a colleague artist working in the Spanish Cave of the Spider clearly depicted a person collecting honey from a bee-tree. Our interactions with honeybees thus appear to rival those with dogs, pigeons and horses as the earliest domestication of animals. As conservators of ancestral knowledge, entrusted to be carriers of the culture, there is an added burden placed upon us to bear witness. 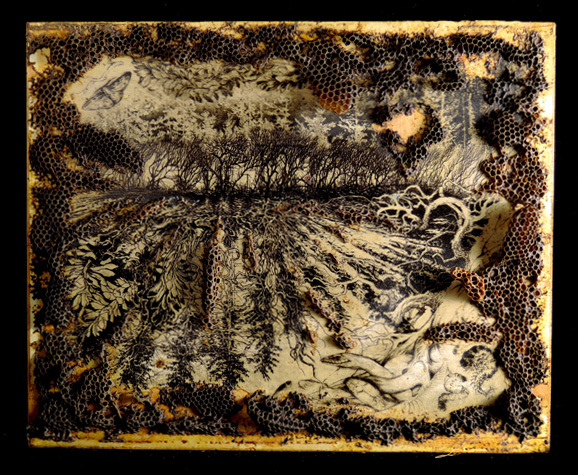 Ladislav R Hanka, Decomposers Embalmed by Honeybees, etching with drypoint and beeswax added by honeybees in a living hive, Ladislav R. Hanka, © 2017. In both of these callings, as artist and as keeper of the bees, I am entering primordial, mysterious worlds that are at once alluring and potentially dangerous. But come walk with me to the studio and over to the bee yards. We’ll have a closer look. It’s no secret to beekeepers that our bees respond differently to our presence than to that of invading strangers. They know far more than you might think. The brain of a bee is admittedly minuscule, but a hive can easily contain 50,000 inhabitants — which is equal to the population of a modest-sized town with schools, clinics, delinquents, police, sewage treatment plants and manufacturing. Bees clearly learn from experience and communicate within the hive what they have learned. But does that extend to actually being interested in me and my artwork? The additions they make do seem to have a compositional sense to them – framing devices of sorts – embellishments, but and somehow appropriate. 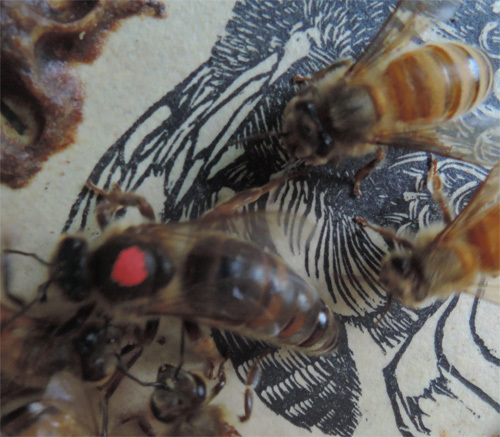 Bees appear to understand what the two-dimensional drawings and etchings I give them actually represent. I once even witnessed a queen respond to an engraved image of a bee several times her size, as if it were a living competitor. She tried to kill that depiction of a bee just as she would a strange queen trespassing in her hive — with a sting to the abdomen. To the biologist still dwelling deep within my bones, that sounds far-fetched, yet I cannot deny what I witnessed. Every bee-keeper has such stories to tell. Hunters, farmers and fishermen much the same. Every dog owner knows their pet responds to them with intelligence and compassion. We are not so separable you and I — we tool users and reflective beings — from the world we inhabit. My artwork extends to a fascination with bee trees — large, dominant trees with prominent features, in whose bark a mere fissure or knothole can lead to a complete world of domed chambers deep within where the legions of bees, guarding their golden trove of honey. And then there are the parasites living inside the hive and pollination and the healing properties of honey and on and on it goes — one thing leading to the next — cycles without beginning, endpoint or resolution. The beauty inhering in these works of art is, of course, based in the usual uses of line and composition to make some sort of elusive and nuanced statement, but beyond that is the synergistic effect that collaboration introduces to the process. 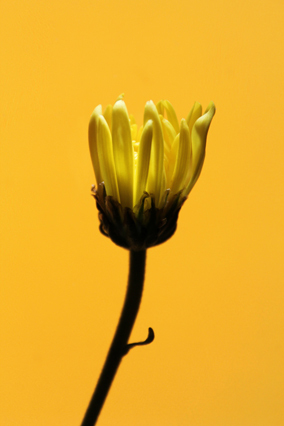 We seem predisposed to being charmed by beautiful surprises more than by our own clever manipulations. I find that I typically approach the hive in anticipation of what the girls will have done this time – the smile that sneaks in unannounced when I open the hive. What we are beholding here is nothing less than the elegance of form following function at the very level of biology, as the veils of honeycomb come down the fronts of my etchings and occlude some of my preciously composed works of art. Oftentimes those little pin-head sized brains of the cute fuzzy little bugs seem to comprehend composition and design and follow my lead as if they were colouring within the lines or picking up the motion I have begun and continuing with that rhythm in the media of wax, propolis and honey. Ladislav R. Hanka, Queen bee stinging the depiction of a much larger bee, photograph, © 2018. Perhaps it is indeed the realization of a morphogenic field – of an artwork whose time has come and which desires to become manifest through the intelligence of the hive or perhaps all hives and all queens as one. Consciousness – perhaps it is indivisible — an omnipresent and universal attribute inhering in all material. Imagine that – and be consequential in your imaginings! Other times the bees will begin to chew the paper away – get good purchase on an exposed edge and keep at it — all my efforts quickly going back to undifferentiated cellulose and tossed out with the dead. Then again, those remaining chewed edges can also be breathtakingly elegant as all nature ultimately is. Form and function. Evolution. Chance and necessity. Survival of the fittest – but not just the old red of tooth and claw saw, but also the elegant solution – like mathematical equations. It is so because it must be — cannot be otherwise. The destruction of a volcano or a flood is breathtaking even within its violence and destruction. The ruthless efficiency of large cats — a dragonfly darting out to catch a honeybee which it carefully holds away from its body as it delicately munches it down to the stinger and tosses it away — all much the same. 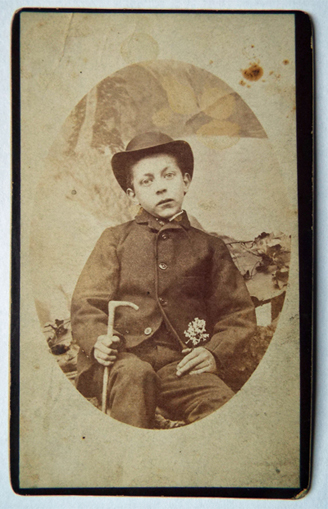 We are able to see what ordinary people in late-Victorian times looked like due to the popularity of what was known as a ‘Carte de visite’. Portraiture no longer the privilege of the rich, it had become possible to get photographed in one of the many studios available. The product was about the size of a playing card, just right for circulating among friends or adding to the family album. Although subsequently displaced by the postcard print that could be mailed, it was the arrival of the Box Brownie camera at the beginning of the 20th century that brought real change. Simple to use, everyone could now take pictures in their own settings, away from the make-believe backdrops provided by the studios.